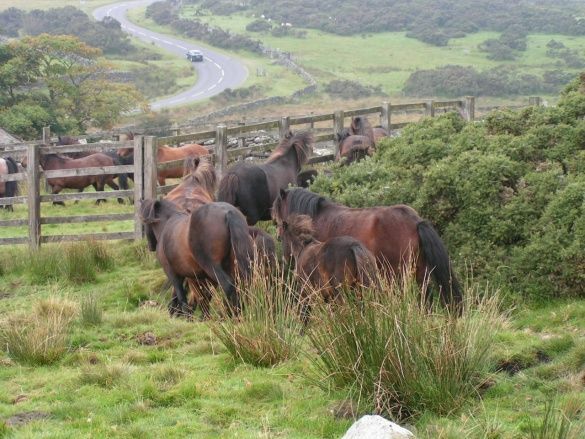 In the 1980’s Mr. John Coaker, a Dartmoor farmer and Duchy tenant, felt something should and could be done about preserving the pedigree pony on the Moor, and to help the Moorland farmers improve their stock. In conjunction with the then Duchy of Cornwall land steward the idea of an upgrading scheme was formed. The Duchy of Cornwall agreed to allow several of their tenant farmers to use some of their land on which to run the upgrading scheme, and in 1988 the Dartmoor Pony Society Moorland Scheme began. To begin with it involved just a few ponies, but it gradually grew in number and the scheme is still run today n conjunction with the Duchy of Cornwall. Ponies were then, and still are now, inspected by two Dartmoor Pony Society Judges – the criteria being they must be bred on Dartmoor, and owned by a member of the Dartmoor Pony Society with a holding number, within the National Park. These are ponies of true Dartmoor type and whole coloured, but have never been registered in the Society’s Stud Book before for various reasons. Once inspected they come into what is called a Newtake (an enclosed area/parcel of land on the Moor) where they run with a licensed fully pedigree stallion for the summer. The progeny is inspected the following year, again by two Dartmoor Pony Society judges, when ponies are collected at Drift time, and if passed as suitable they move up a grade. Ponies are microchipped by the veterinary surgeon in attendance, and paperwork for Passports completed before they are taken back to the owners farms for winter. The Scheme starts off after inspection with a mare becoming an SR (Supplementary Register), progeny of which becomes SR1 (Supplementary Register1) Female progeny are encouraged to return in to the Newtakes when old enough with a monetary incentive given the first time it returns into the Newtake. The next progeny thus becoming SR2 (Supplementary Register2) with the females once again encouraged to return as the resulting progeny becomes Fully Registered in the main body of the Stud Book. Male progeny are usually gelded and become good children’s ponies. A Supplementary Register colt may not be used to sire Registered Pedigree Stock nor may it be used as a Stallion in the Newtakes. These days up to two Newtakes, with a pedigree stallion, take place with maximum of fifteen mares in each, and in the past two years a Newtake has been opened for farmers to put mares in, which they wish to keep empty, away from a stallion thus preventing overbreeding in the present economic climate. This has proved extremely popular and had 24 barren mares running in it during 2012. The Scheme has been in existence since 1988 and been a great success, improving the pony on the Moor by using good quality stallions. Many of the ponies born in the Newtakes as part of the upgrading scheme, have gone on to successful careers in the show ring and under saddle. However the main aim of the scheme has been achieved by improving the true to type Dartmoor on the Moor, and those who first thought of the idea should be congratulated on their forward thinking.